The Atlanta Braves head to Citi Field on Wednesday to take on the New York Mets. The probable pitchers are Ryan Weber for the Braves and Bartolo Colon for the Mets. The opening line for this game has Atlanta at +185 and New York at -200. The over/under is 8.5. The Braves have a 78-64-8 over/under mark and a 77-73-0 run line record, meaning they cover 51% of the time. The Mets are 70-80-0 against the run line and have a 67-80-3 over/under record. They cover the spread 47% of the time. The Braves head into this game with a 59-91 record, and they are 33-42 on the road. Starting pitcher Ryan Weber has a 1-1 record with an ERA of 5.46 and a WHIP of 1.44. He has 20 strikeouts during his 31.1 innings pitched and he has given up 42 hits so far this year. He has surrendered 12.1 hits per 9 innings and he has a FIP of 4.41. The bullpen this season has an earned run average of 4.07 and they have allowed 509 base hits on the year. Teams are hitting .248 against the pen while they've been struck out 508 times and walked 239 times this year. As a unit, Atlanta has given up 8.87 base hits per nine innings while striking out 7.62 hitters per nine. They are 26th in the Majors in team earned run average at 4.59. The Braves pitchers have collectively given up 1,330 base hits and 688 earned runs. They have allowed 167 home runs this season and they allow 1.1 homers per nine innings as a staff. Atlanta as a pitching staff has walked 510 batters and struck out 1,142. They walk 3.4 men per 9 innings while striking out 7.6 per 9. They have a team WHIP of 1.36 and their FIP as a unit is 4.33. As a team, Atlanta is hitting .254, good for 18th in the league while putting together a .249 average on the road. The Braves have a .381 team slugging percentage and an OBP of .320 which is good for 17th in the league. They rank 15th in baseball with 8.74 hits per contest. Freddie Freeman comes into this game hitting .302 and his on-base percentage is at .397. He has 167 hits this season along with 93 runs scored and 83 runs batted in. He's struck out 157 times and has walked 81 times. Nick Markakis is hitting .273 and he has an on-base percentage of .347. He has totaled 155 hits so far while scoring 63 runs and he's driven in 86. He has walked 66 times and has struck out 96 times. The Braves have 1,311 hits, including 281 doubles and 109 home runs. They've stolen 66 bases while they've been thrown out stealing 33 times. Atlanta has walked 467 times this season and they've struck out 1,142 times as a unit. They've left 1,090 men on base and have a team OPS of .702. They score 3.97 runs per contest and have scored a total of 595 runs so far this year. New York comes into this game with a 41-34 home mark and a 80-70 overall record. With an ERA of 3.14, Bartolo Colon has a 14-7 record and a 1.20 WHIP. He has 116 strikeouts over the 177.2 innings he's pitched during which he has given up 181 hits. He has allowed 9.2 hits per nine innings and his FIP stands at 3.96. So far this season the bullpen has an earned run average of 3.52 and they have given up 423 base hits on the year. Teams are hitting .233 against the Mets bullpen while being struck out 510 times and walking 169 times this season. As a team, New York has allowed 8.66 hits per nine innings while striking out 8.65 batters per nine. They are 3rd in the league in team earned run average at 3.55. The Mets pitchers as a team have surrendered 1,287 base knocks and 526 earned runs so far this season. They have given up 139 home runs this year and they give up 0.9 home runs per nine innings as a staff. New York as a staff has walked 404 hitters and struck out 1,287. They give up a walk 2.7 times per 9 innings while they strike out 8.7 per 9. Their team WHIP is 1.26 while their FIP as a staff is 3.54. As a team, they are batting .242, good for 28th in the league while putting together a .235 average at home. The Mets hold a .413 team slugging percentage and an on-base percentage of .311 which is good for 26th in baseball. They rank 27th in baseball with 8.11 hits per contest. Asdrubal Cabrera comes into this matchup batting .274 and he has an OBP of .328. He has 130 hits this year along with 59 runs scored and 49 RBI. He's struck out 98 times and has walked on 32 occasions. 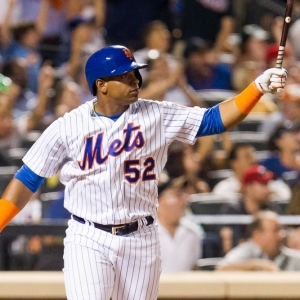 Yoenis Cespedes is hitting .287 and he has an OBP of .356. He has collected 125 hits so far while he's scored 64 runs and drove in 81. He has earned a walk 45 times and has punched out 100 times. The Mets as a unit have 1,216 base hits, including 215 doubles and 203 homers. They have 37 stolen bases while they've been thrown out 16 times. New York as a team has walked 463 times this year and they have struck out 1,218 times. They've had 1,023 men left on base and have an OPS of .724. They score 3.92 runs per game and have totaled 588 runs so far this season.